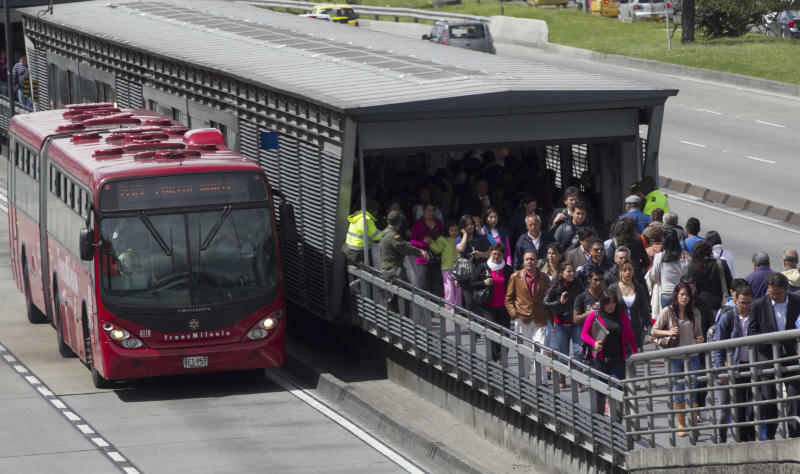 BOGOTA, Colombia (AP) — Bogota's eco-friendly mass transit system has been widely emulated around the globe, so urban planners were dismayed when a protest by frustrated commuters turned into a free-for-all that nearly paralyzed Colombia's capital. Anger over the TransMilenio system's overcrowded, deteriorated state was behind last week's protest, which began at five of the bus rapid transit system's 114 stations before spinning out of control and devolving into battles between protesters and riot police. Vandals in ski masks looted and broke windows. Bus drivers abandoned their shiny, double-length vehicles and fled. Earlier protests over the system's decline had been isolated. This one seemed coordinated. "The stations are like rivers of people and there's no control," complained German Augusto Guarumo, a 52-year-old lawyer and commuter who says the system has become unmanageable during peak travel hours. Friday's rioting was a shock to an 11-year-old system that urban planners have lauded, along with a similar network in Curitiba, Brazil, as a promising alternative to rail systems. Its low-emission buses briskly ply dedicated lanes that typically border traffic-choked avenues. Prized for their efficiency, low cost and smog- and congestion-fighting prowess, such systems have sprung up in cities from Jakarta, Indonesia to Mexico City to Los Angeles and Cleveland, Ohio. 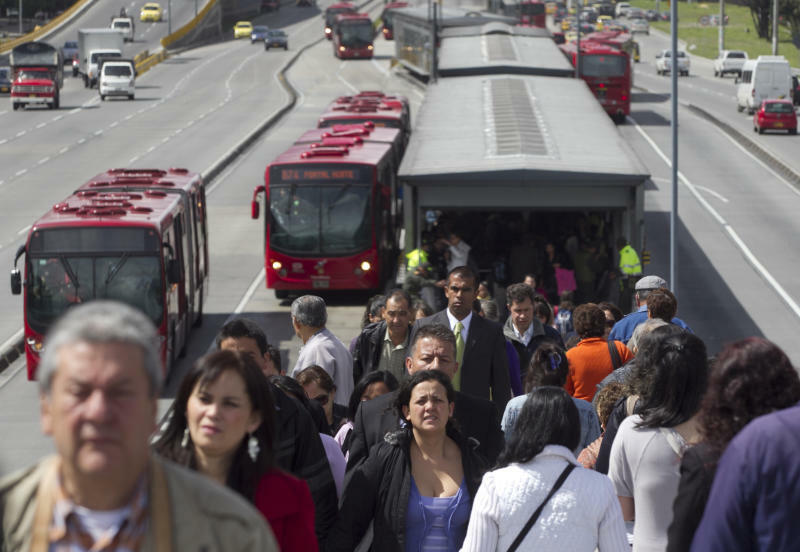 But the TransMilenio has become a victim both of its own success and of official neglect. It became overloaded as the capital's motor pool grew by about 100,000 automobiles annually over a decade and two consecutive city administrations did almost nothing to expand it. It was built to handle half of the 1.7 million passengers it now carries daily. And it's not as if Bogota residents have an alternative. There are rickety old belching buses on some avenues. But most main thoroughfares belong to TransMilenio alone. Other Latin American cities with bus rapid transit systems tend to have alternatives. Santiago, Chile, has an underground metro. So do Mexico City and Buenos Aires, Argentina, where the variety of options include a bus rapid transit system launched last year. The success of bus rapid transit is not measured in easing vehicular traffic alone. Economists like it for its affordability. Environmentalists like it for its climate- and public-health friendliness. The TransMilenio has reduced particulate emissions by 1,000 metric tons a year, saved Bogota $60-70 million in health care costs from decreased respiratory and other ailments and reduced carbon emissions by more than 1.7 million tons between 2006-2009 alone, according to a 2010 study by Manuel Olivera, Colombia's director for the Clinton Climate Initiative. It has also already earned Bogota $3 million in direct carbon reduction payments under the Kyoto Protocol. For commuters, the benefit has come primarily in relief from the congestion caused by the 1.4 million automobiles that bloat Bogota's roads, sometimes producing near-gridlock conditions. That congestion worsened during the previous administration of Samuel Moreno. The former mayor is on trial for allegedly soliciting and receiving payoffs in granting major construction contracts including one to expand the TransMilenio. Enrique Penalosa, who as Bogota's mayor from 1998-2001 launched the TransMilenio, says at least 18 percent of the TransMilenio's users have cars but leave them at home at least two days a week to comply with vehicle restrictions based on license plate numbers. One complaint of riders is that the fare is expensive at $1 per trip because the overcrowding makes their commute longer. Police say they don't yet know who organized Friday's protest. About 60 participants were arrested but later released. Authorities put the damage at a half million dollars and 11 injuries were reported. The violence came as Bogota's new mayor, former M-19 leftist rebel Gustavo Petro, seeks to renegotiate contracts with some of the system's 26 concessionaires that expire in 2014. He claims the city, which does not subsidize the system, deserves more than 5 percent of the TransMilenio's profits because it provides the infrastructure and security. The concessionaires have not yet agreed to open negotiations. Petro contends his political opponents were behind Friday's protest. But Penalosa blamed Petro, claiming the mayor promoted the protests as part of his campaign to renegotiate contracts. System users, meanwhile, say they're tired of finger-pointing. "It's going to take a tragedy until these people realize that we are human beings and not merchandise," said Carmenza Contreras, a 38-year-old architect. Bajak reported from Lima, Peru. Associated Press writer Cesar Garcia in Bogota contributed to this report.